He's annoying. He's dangerous. He smells terrible. But the public love him. That's right-the Merc with the Mouth may make money for missions of murky morality... but he's become the most popular hero in the world for it. Eat that, Spidey! The world belongs to... DEADPOOL. The fan favorite team of Gerry Duggan and Mike Hawthorne return to bring Deadpool in to his most successful adventures yet! Deadpool #3.1 2016 Pencils by Mike Hawthorne. Gerry Duggan Story. Tres Punto Uno. Meet 'Masacre' - the Deadpool of Mexico! 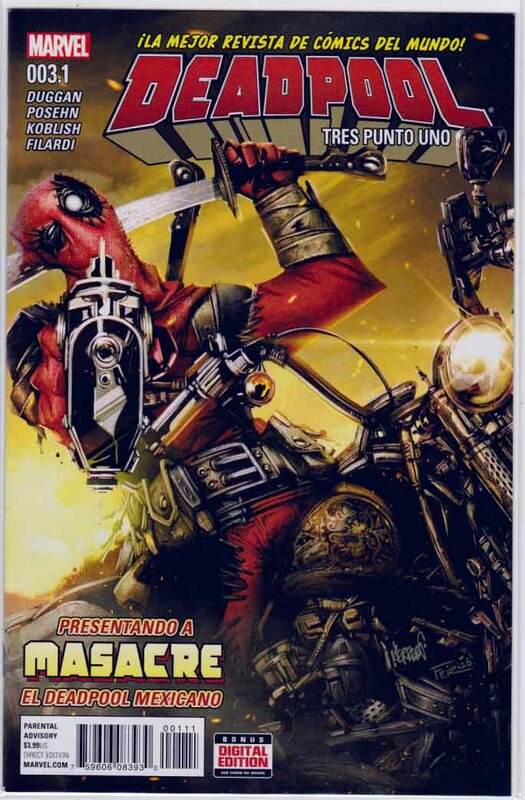 Did you know that Deadpool in Spanish-speaking countries is called 'Masacre'? 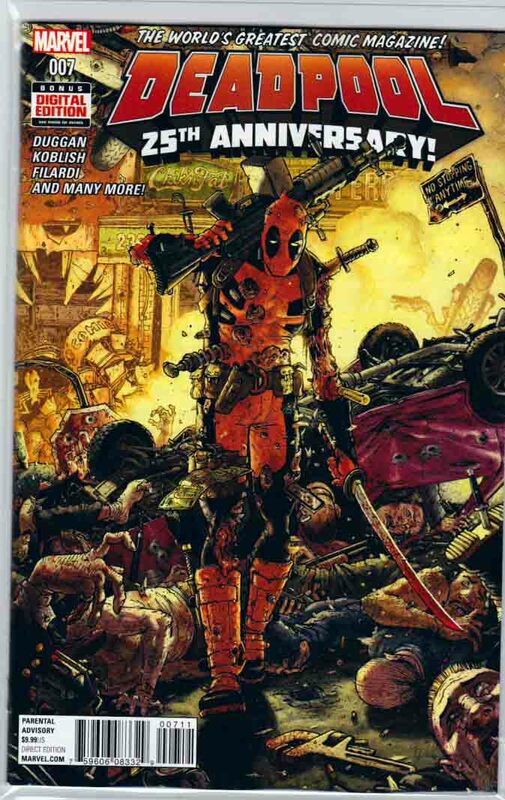 Here comes the issue to make all of that even more confusing, as we meet Masacre, the deadly Deadpool-inspired vigilante south of the border! Watch him slaughter his way into your hearts in this entirely Spanish language one-shot written, drawn, and edited by folks who don't speak it! INTRODUCING: DEADPOOL 2099! Jump 84 years into the future for an all-new adventure with an all-new Deadpool! Who is this sci-fi Mouthy-Merc-Lady? And what's her connection to Wade Wilson? Deadpool #7 2016 Regular Tony Moore Cover. Pencils by Scott Koblish. Gerry Duggan Story. Twenty-five years ago in February 1991, the New Mutants encountered a blabber mouthed mercenary who tore through Xavier's mansion and into the very heart of the 1990s. Now, that self-same degenerate is one of the most popular heroes in the world, an Avenger, and maybe the smelliest and grossest person that tumblr swoons over. Come see how Deadpool reacts to life at the top of the world... (hint: he does not handle it well). 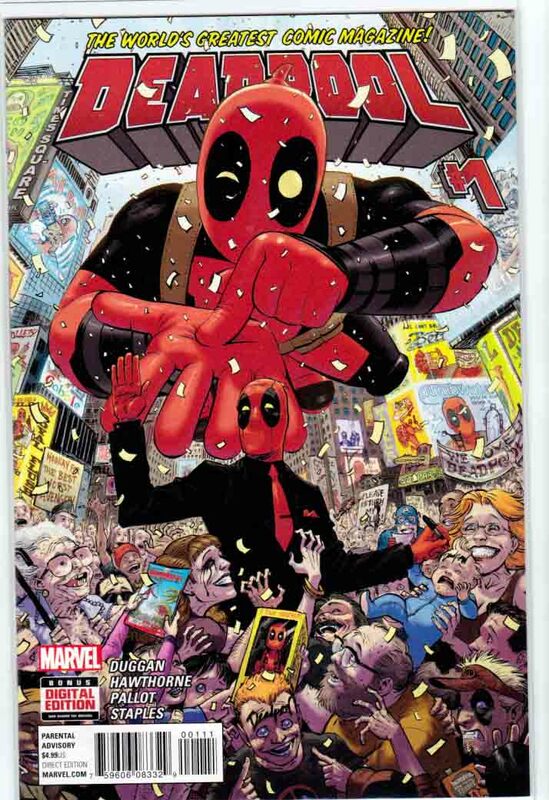 PLUS: A full array of stories from Deadpool's new allies, the members of the Mercs for Money! 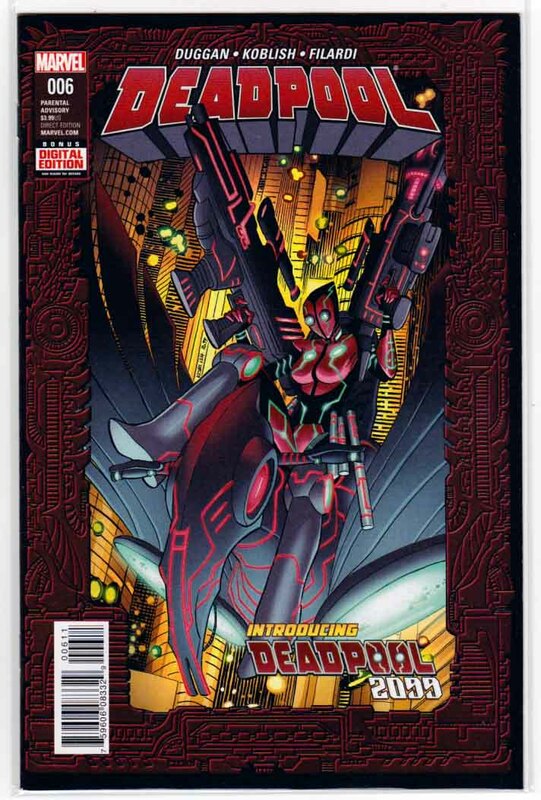 Oh... and I think there is, like... some other Deadpool thing this month people are excited about? I forget what. Deadpool #11 (2016) Variant Scott Koblish Secret Comic Cover. Pencils by Matteo Lolli. Gerry Duggan Story. 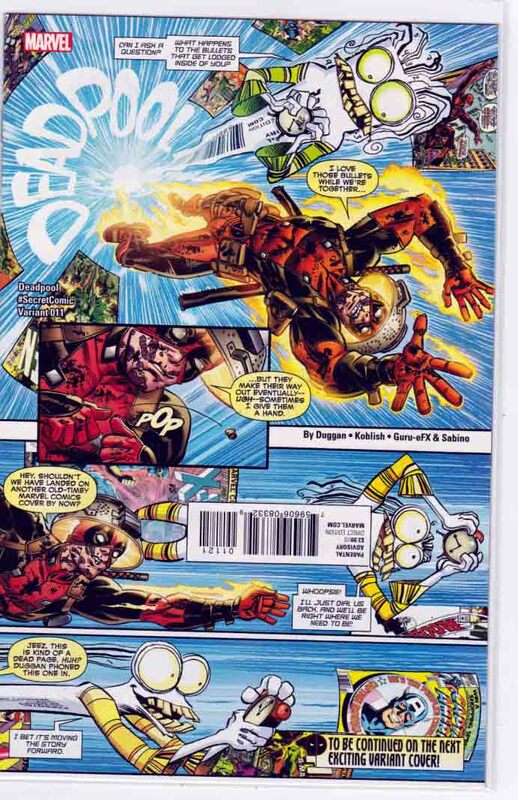 DEADPOOL VS. SABRETOOTH concludes here! Hidden secrets! Healing factors! Horrible violence! All this, plus: Magneto! Deadpool #13 2016 Regular Francisco Herrera Cover. Pencils by Scott Koblish. Gerry Duggan Story. 1st appearance of Mao. An all-new epic four-issue crossover in one package! 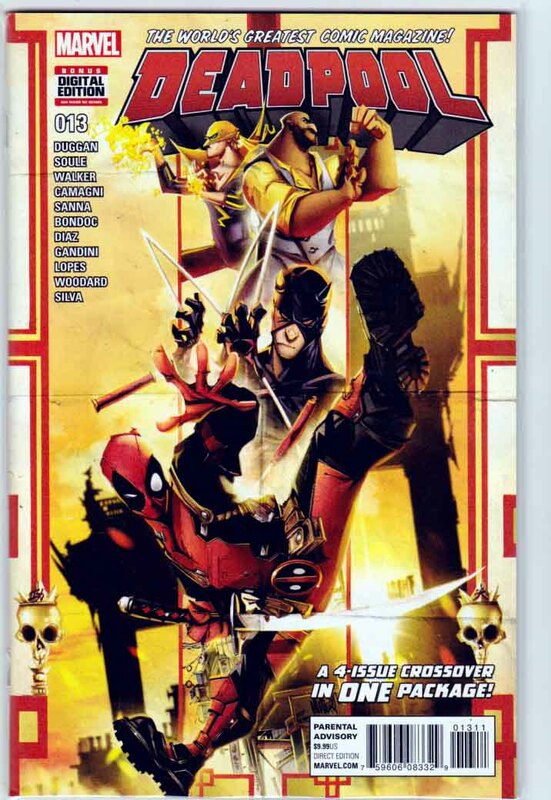 This issue of Deadpool (lucky number 13) LITERALLY contains two issues of DEADPOOL, one issue of DAREDEVIL, and one issue of POWER MAN & IRON FIST! When Deadpool take a gig protecting a banker who betrayed his cartel partners, they seek the help of Assistant District Attorney Matt Murdock, who calls in the assistance (and fists) of Power Man Luke Cage and Danny Rand, master of the Iron Fist! A mega-violent, street-level, face-punching, gut-busting, kung-fuing, ninjitsuing crime story guaranteed to knock your teeth out! Bringing together the writers of the DEADPOOL, DAREDEVIL, and POWER MAN & IRON FIST series: Gerry Duggan, Charles Soule, and David Walker! 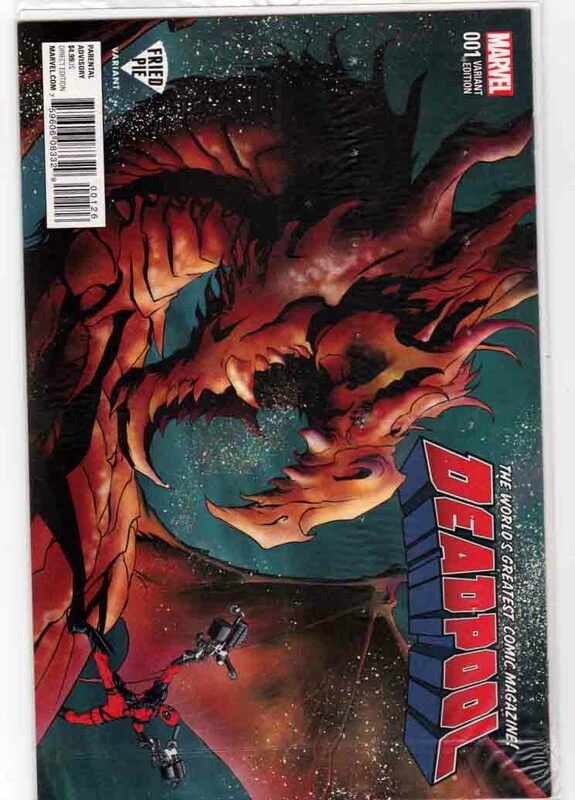 Deadpool #14 2016 Regular Rafael Albuquerque Cover. Pencils by Scott Koblish. Gerry Duggan Story. Civil War II Tie-In. 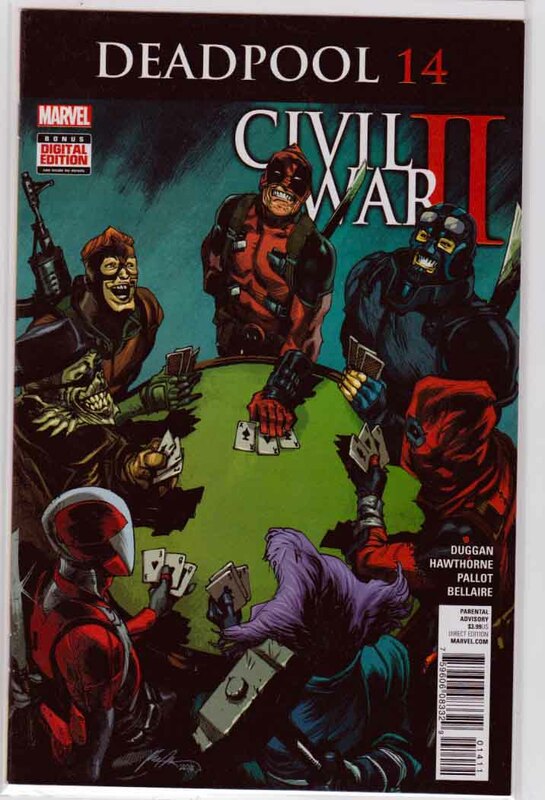 Deadpool and the Mercs for Money are clearly the best team in the Marvel Universe. So naturally when there is a cosmic-level threat, they'll be there. Oh - also, they get along REALLY WELL. This arc is going to be all about happy people getting along, right? Deadpool #15 2016 Regular Rafael Albuquerque Cover. Pencils by Mike Hawthorne. Gerry Duggan Story. 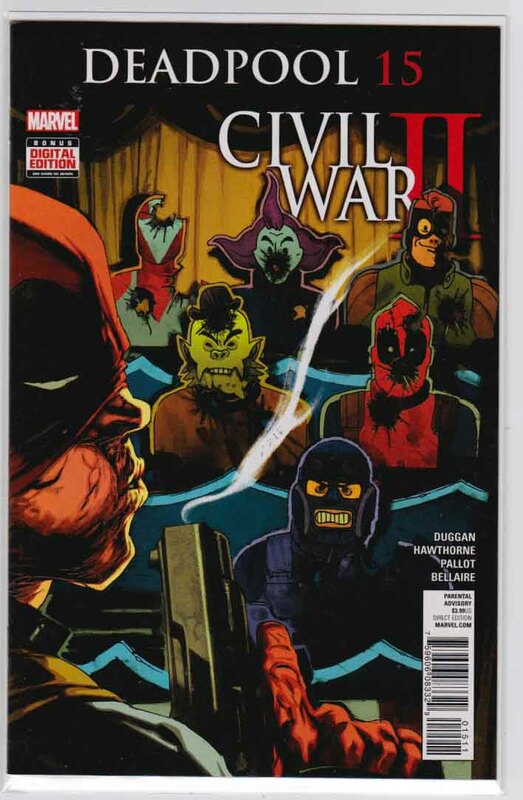 Civil War II Tie-In. The Mercs for Money hate Deadpool and want out! Wait... isn't there a new Mercs for Money series launching? How is that going to work?